This splitter allows you to share power between five camera's so that you don't have to run indiviual power to each camera. For example, it means you can have a 12V power supply powering four camera's not just one. It provides a simple soultion for power connectivity, safe & reliable. 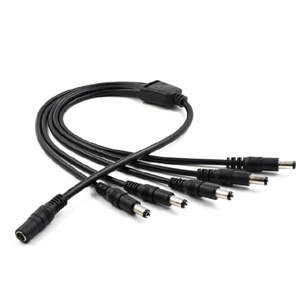 DC extension cables are available in 10m or 20m lengths to extend each output to each camera. Compatible with all our cameras and power supplies.